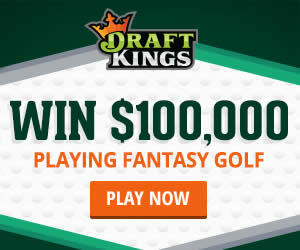 You love playing fantasy golf – Well there is one Top Fantasy Golf site out there and it is DraftKings.com. You probably have heard of them and seen their promos on TV or heard them on the Radio and now you are interested on learning more about them. Here we will give you a Review of DraftKings Fantasy Golf games, tell you about our Special Bonus Ticket Offer and keep updating this page with current golf promos being run by DraftKings. 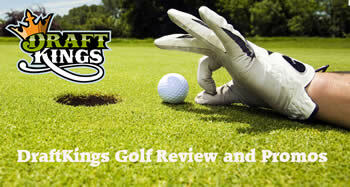 We are affiliate partners with DraftKings, read further down the page for more details. DK offers a simple salary cap game format for fantasy golf players to play. You are given a salary of $50,000 and need to pick 6 golfers to fit under that cap. Players range in price anywhere from $5,000 up to $13,000 for the Top PGA Tour Golfers in that week’s field. If you are going to pick the high priced guys you’ll have to find some low cost sleepers to fit everyone under the cap. Lineups lock at the 1st tee off of the tournament so if a player pulls out just before they tee off or during the tournament your team will be stuck. You can follow along the progress of the players as it updates shortly after the golfer has finished a hole. If you aren’t watching the tournament live, you can follow the action right from the DraftKings site. Generally speaking if all 6 of your golfers make the cut you will probably cash in if you are in a big contest like the Fantasy Golf Millionaire. If you get 5/6 to make the cut, having the eventual winner of the tournament (or all 5 finish in the Top 20) will probably get you into the cash as well. There are Free games to play - including our FREE Ticket Bonus – all the way up to $5,300 a game (for the real pros). You can play in big tournaments for big cash prizes or play in smaller field contests or the most popular 50/50 games where the top half of the players win money…this is a great way to win money playing daily fantasy golf. If you aren’t comfortable playing against strangers then get your golfing buddies to join and create a private league to play. DraftKings has the biggest golf contests and the most players! The other Top Fantasy Golf Sites have great games but if you truly want to play for big cash prizes – DraftKings is where you need to join! They have a great interface, tons of choices for games and even FREE games to try out or play for fun. Of course we have our DraftKings Bonus offer of a FREE Contest Ticket just for making a 1st deposit of $5 or more. It’s very simple – Join DraftKings Here (Don’t worry about a DraftKings Promo Code, you don’t need it when you use our links) and when you make a deposit you’ll get credited a Free Contest ticket that you can use at a contest like the PGA Birdie. Easily the BIGGEST Fantasy Golf Contest for the 2017 US Open Golf Tournament! $20 to enter, $3.5 Million in cash prizes and a grand prize of $1 Million to the 1st place winner – Nobody has a bigger contest than this one. 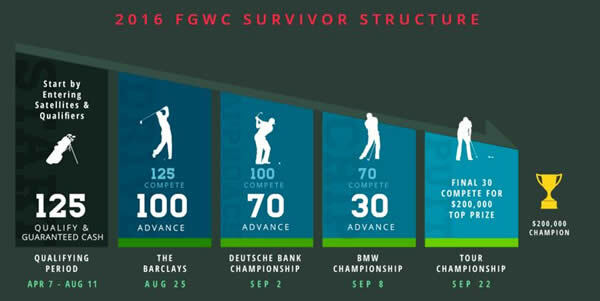 Play in qualifying tournaments throughout the Golf season and then play in a Fantasy Golf Survivor Contest for the Fed/Ex Cup Playoffs. $1 Million in total Prizes and a 1st place prize of $200,000! Want to party in Las Vegas with Tiger Woods? For as little as $0.25 you can play for a chance to head to Las Vegas, stay at the MGM Grand, play golf and have a picture taken, private golf exhibition, and Q&A opportunity with golf legend Tiger Woods. This is a once in a lifetime prize and only runs until April 14th, 2016.